Recent surveys show that 1 in 8 Americans is an alcoholic. One of the most prevalent substance abuse syndromes in the country, alcohol addiction causes severe and fatal accidents, harms families and society, and even kills. Despite the danger, alcohol plays an integral role in many societal milestones. It’s prevalent at parties, graduations, weddings, and in homes all across the country. Over two-thirds of Americans consume alcohol, but only about 10% of the population is consuming up to half of all alcohol bought and poured in the country. 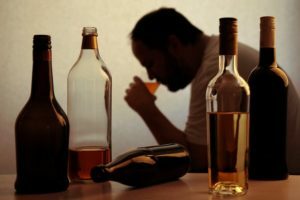 The following article will cover alcohol withdrawal symptoms, the timeline for withdrawal, and how to find relief from painful symptoms and alcohol addiction. Alcohol impairment is particularly dangerous for anyone who commutes. 29 people die every day in the U.S. from drunk driving accidents, and over 44 billion dollars are lost per year from drunk driving crashes. Lost wages, productivity, medical costs, property damage, and insurance and EMS service costs account for another 200 billion dollars directly related to drunk driving. Also, anyone caught driving over the legal limit of .08 blood alcohol level (BAC) is subject to substantial fines and even jail time. Furthermore, these people may lose their driving licenses for years, leading to more lost wages and productivity. Drunk driving charges, when attorneys fees, jail time, impound, and insurance costs are added, average between 10,000 and 15,000, further straining those with alcohol addiction. Alcohol abuse is a factor in 40% of violent crime arrests. Half of all jail inmates struggle with alcohol addiction. And, alcohol is a factor in over 40% of all suicide attempts per year in the United States. For those in recovery, alcohol addiction is extraordinarily complicated. Ongoing maintenance plans and support are crucial for helping someone maintain sobriety. Also, long-term alcohol abuse and addiction can lead to painful and potentially fatal withdrawal symptoms. Family and friends must encourage and support their loved ones to get help from trained medical professionals. Without proper supervision and guidance, people trying to beat an alcohol addiction can experience dangerous medical complications, and alcohol withdrawal symptoms can linger for weeks or months. There are three stages in the alcohol withdrawal timeline. The first stage begins as soon as 8 hours or less after the last drink. Stage 2 starts within 24 hours of the last drink, lasting for 72 hours. Finally, stage 3 begins after the first 72 hours from the last drink. This stage is intense, painful, and where potentially fatal medical complications can emerge. Stage 3 lasts up to a week when symptoms finally begin to subside. However, for long-term alcohol abusers, those with comorbid conditions or complications from alcohol abuse can have lingering, and sometimes permanent health conditions as a consequence of alcohol addiction. Without treatment for symptoms, a person can experience active alcohol withdrawal symptoms for weeks after the last drink. What physical symptoms does someone experience during alcohol withdrawal? During the first stage, a person in withdrawal will experience insomnia, and stomach pains and nausea. At stage 2, they may experience high blood pressure, increased body temperature, and changes in heart rhythm. During this stage, people with cardiovascular issues or even suspected cardiovascular problems must be monitored for signs of a heart attack or stroke. During the third stage of the withdrawal timeline, people in recovery will experience a fever, and possibly a dangerous condition called delirium tremens. With delirium tremens, patients develop a dangerous fever, tremors, and seizures. They may slip into a coma, experience respiratory arrest, and die. Long-term, they may have problems with motor control and coordination. Or even experience hearing loss. If they’ve had an accident or injury and trauma as a result of alcohol abuse, they may develop arthritis or joint and muscle problems. What psychological issues or emotional problems will people experience during alcohol withdrawal? People who are going through alcohol withdrawal will experience anxiety, agitation, confusion, and hallucinations. Long-term, they may have problems with memory and regulating their emotions. People who’ve recovered from active alcohol addiction will experience difficulties with occasional cravings, and will possibly go on to experience an episode of clinical depression. Ongoing therapy sessions and support from loved ones and the community are vital for an alcohol addict to remain sober and handle any long-term problems in a positive, productive way. Without help, people are at increased risk of relapse or harming themselves. Is it safe to quit alcohol cold-turkey, or should someone go to a medical detox center? It is not safe to quit alcohol without medical supervision, especially if someone has been addicted for many years. Also, alcohol withdrawal symptoms can be even more intense and severe if someone quits cold turkey. In a medical detox facility, alcohol can be safely tapered off under doctor supervision, or medications like benzodiazepines can be prescribed to help the person wean off the alcohol. What is safe for alcohol detox? Benzodiazepines, tapering off with small amounts of alcohol, anti-anxiety medication, mood stabilizers, and short-term sleep aids are all safe for those in recovery. In a medical detox center, doctors are on-call to help patients with severe alcohol withdrawal symptoms. Also, if dangerous delirium tremens or heart arrhythmia issues arise, doctors can swiftly deal with them, keeping patients safe. At home, patients don’t get much-needed medical help and supervision. What’s not safe to take during alcohol detox? Other illegal drugs and more alcohol are not safe to take. Also, trying to detox at home without medical help or adequate support is dangerous. People can develop potentially fatal conditions and possibly injure themselves or die. Also, people in recovery are at high-risk of developing severe depression and having suicidal thoughts or attempting suicide. Family members are not equipped to deal with these complications. Recovering alcoholics need a professional support system in place to stay safe and achieve lifelong sobriety. What happens during the alcohol withdrawal process? When a person struggling with alcohol addiction enters a medical detox facility, doctors monitor them for any health conditions. Patients are assessed and treated for underlying physical and mental health problems, and patients are also safely able to detox with the help of replacement medications. Prescription drugs are also given to alleviate withdrawal symptoms. Once the peak of withdrawal subsides, patients can begin working with a therapist to overcome their addiction issues, and to develop plans and coping mechanisms for living outside of the facility and maintaining sobriety. The patient’s lifestyle, how long they’ve been addicted, if they are addicted to other drugs, or if any underlying physical or mental health conditions are present will determine how long someone needs to stay in a facility, and also what kinds of therapies will best work for their situation. Some patients may only need one-on-one therapy sessions, while others will benefit from group and family therapy. At a rehab center, patients have access to a variety of treatments to meet their particular needs. Therapists and doctors are on-call 24/7, and counselors are there to help patients begin learning how to cope and live their best life outside of rehab once they complete detox. Also, in a rehab facility, patients are around other people going through similar struggles which can offer support and understanding for what they are going through. Rehab centers are also equipped with holistic and integrated treatment methods. Progressive therapy and treatment believe the whole individual needs healing. Art and sports therapies, and sometimes relaxation therapies such as massage and yoga are available for patients. These therapy methods have been shown to help people who’ve been addicted for many years, and those who have relapsed. Every patient is unique, and alcohol addiction looks different for each person. Many people will suffer from comorbid mental health conditions which have fed their substance abuse. Medical detox facilities and inpatient rehab centers are the most effective treatment options available for people with these unique challenges. Others may also struggle with addictions to other drugs or substances besides alcohol. Family support and working with trained counselors, doctors, and social workers is critical for someone to maintain sobriety. Please do not hesitate to get treatment for alcohol abuse and speak to a licensed counselor for treatment at a medical detox center today.